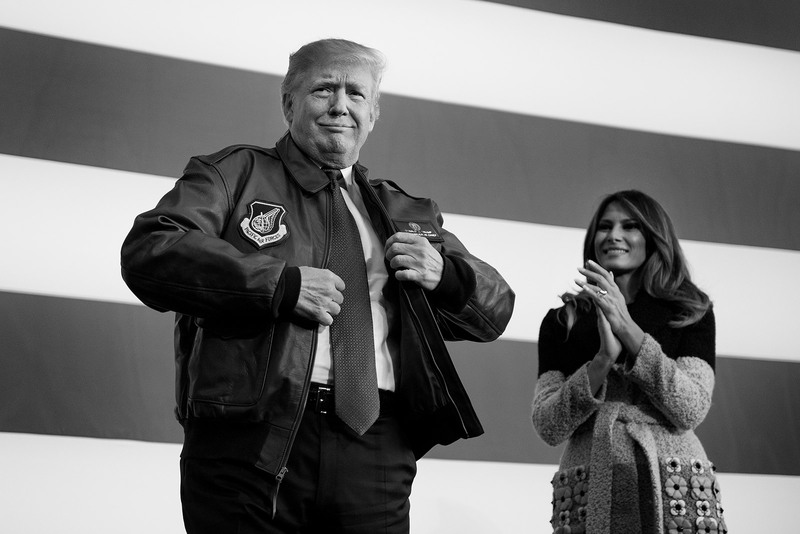 President Donald Trump, accompanied by first lady Melania Trump, puts on a bomber jacket that he received from US forces in Tokyo on Sunday, November 5. President Donald Trump has wrapped up a high-stakes trip that took him through five Asian nations — Japan, South Korea, China, Vietnam and the Philippines — over nearly two weeks. It is his longest foreign trip as President, and it is the longest Asian trip for a US President since George H.W. Bush in 1992. Much of the focused on rallying regional powers to pressure North Korea into abandoning its nuclear and ballistic missile programs. North Korea has stepped up its provocations since Trump took office. Trade was also a leading objective of the trip, according to the White House. Follow Trump’s journey here, as seen through the lens of Jim Watson, a photographer who covers the White House for Agence France-Presse. Trump wrapped up his trip after giving remarks to leaders at the East Asia Summit in Manila, Philippines. The summit was running a few hours behind, so Trump skipped its plenary session to travel home. Before boarding Air Force One, Trump gave a brief on-camera statement in which he reflected on his Asia trip and touted gains made on trade and North Korea, according to CNN’s Dan Merica. A press handler reads off names before the “family photo” for the East Asia Summit in Manila. Trump -- flanked by national security adviser H.R. McMaster, left, and Secretary of State Rex Tillerson -- speaks at the East Asia Summit before leaving early. Politico reporter Andrew Restuccia sends a note to other reporters before departing Manila with Trump on Air Force One. Trump walks off Marine One before boarding Air Force One for the ride home. White House Communications Director Hope Hicks, second from left, asks for no more questions as Trump speaks to reporters aboard Air Force One. Trump and Philippine President Rodrigo Duterte lavished pleasantries on each other during public appearances in Manila, and they also had a meeting behind closed doors. The White House said the two leaders "briefly" discussed human rights and Duterte’s bloody war on drugs. A Duterte spokesman told reporters that "human rights did not arise" during the meeting. Duterte, as part of an effort to rid the Philippines of drug users, has publicly cheered on and inspired thousands of extrajudicial killings during his time in office, drawing scorn from human rights organizations. Trump and other world leaders engage in an awkward handshake during the summit for the Association of Southeast Asian Nations (ASEAN). From left are Thai Prime Minister Prayut Chan-o-cha, Russian Prime Minister Dmitry Medvedev, Vietnamese Prime Minister Nguyen Xuan Phuc, Trump, Philippine President Rodrigo Duterte, Australian Prime Minister Malcolm Turnbull and Singaporean Prime Minister Lee Hsien Loong. Trump’s limo pulls up outside the ASEAN summit in Manila. A reporter holds up her cell phone to take a photo as US Secretary of State Rex Tillerson, front, and and White House national security adviser H.R. McMaster, right, listen to Trump’s meeting with Japanese Prime Minister Shinzo Abe and Australian Prime Minister Malcolm Turnbull in Manila. Performers dance during the opening ceremony of the ASEAN summit. A handwritten correction is seen on Trump's speech as he addresses the ASEAN summit. Trump spent part of the day in Hanoi, Vietnam, wrapping up his stay in the country before traveling to the Philippines, the final stop on his trip. Trump’s stay in the Philippines included stops at the East Asia Summit and the summit for the Association of Southeast Asian Nations (ASEAN). Trump attends an arrival ceremony in Hanoi. A staff member runs across the hall as Vietnamese President Tran Dai Quang prepares to welcome Trump in Hanoi. Trump is seen in his limo as he arrives in Hanoi. Members of the White House press corps walk past Air Force One as Trump arrives in Manila, Philippines. A US Embassy official holds a folder on Trump's trip to Manila while traveling via helicopter. Trump arrives for a special gala dinner at the ASEAN summit in Manila. Trump attended more events for the Asia-Pacific Economic Cooperation summit in Da Nang, Vietnam. While traveling from Da Nang to Hanoi, the President told reporters aboard Air Force One that he believed the assertions of Russian President Vladimir Putin, who said he did not meddle in the US presidential election. "He said he didn't meddle. He said he didn't meddle. I asked him again. You can only ask so many times," Trump said. "Every time he sees me, he says, 'I didn't do that,' " Trump added. "And I believe, I really believe, that when he tells me that, he means it." Trump’s remarks run counter to the findings of the US intelligence agencies, who have concluded that Russian intelligence agencies were responsible for the hacking and leaking of information to influence the US election. Trump and Putin also released a joint statement on fighting ISIS in Syria after meeting on the sidelines of APEC on Saturday. In it, the two leaders stressed the need to keep existing military communications open and said the conflict does not have a military solution. Trump attended a state with Vietnamese President Tran Dai Quang on Saturday night. Members of the White House press corps stand on the side of the road after being informed they were denied access to cover Trump's meetings at the APEC summit in Da Nang. This tweet from New York Times photographer Doug Mills, seen on the cell phone of AFP photographer Jim Watson, was sent out in protest after the White House press corps was denied access to cover Trump’s meetings at the APEC summit. A Vietnamese security guard peers out from behind a pillar as he stands guard near an armored vehicle in Da Nang. Trump speaks to reporters after departing the APEC summit in Da Nang. Traffic watches from behind a barricade as Trump’s motorcade passes in Da Nang. Trump walks off Air Force One as young girls wave American and Vietnamese flags in Hanoi. Trump traveled to Vietnam, the fourth stop on his Asia trip, for a summit of Pacific Rim leaders. In a speech delivered at the start of the summit, Trump rebuked trade practices that have harmed American workers. He told the audience he would no longer be pursuing multinational trade agreements, opting instead for bilateral deals “with any Indo-Pacific nation that wants to be our partner and that will abide by the principles of fair and reciprocal trade.” He said he didn’t blame other countries for taking advantage of the United States on trade. He pointed the finger at past US administrations, saying they ignored imbalances in trading practices. Members of the White House press corps board Air Force One before flying from China to Vietnam. Trump’s hair blows in the wind as he boards Air Force One. An honor guard marches in Da Nang, Vietnam, after Trump arrived at the airport. Trump delivers a speech at the start of the Asia-Pacific Economic Cooperation summit. New York Times photographer Doug Mills tries to stop a frisbee with his foot while playing with other members of the White House press corps in Da Nang. They had been told they would not be able to cover the summit’s gala dinner and cultural performance because the White House could not secure them passes for the event. On the second day of Trump’s visit to Beijing, he and Chinese President Xi Jinping huddled for hours inside the Great Hall of the People, situated on the western edge of Tiananmen Square. In statements to reporters after their talks, Trump and Xi offered placatory views of US-China ties, and they insisted that differences between the two countries would be cast aside in place of a cooperative partnership. The two men sought to put forward a united front on North Korea, which has been a persistent area of focus for Trump during his tour through Asia. “The entire civilized world must unite to confront the North Korea menace,” Trump said. Secret Service members stand next to the presidential limo in Beijing. Young children with flags and flowers wait to begin cheering as they prepare for Trump’s arrival ceremony at the Great Hall of the People. A Chinese honor guard marches at Trump’s arrival ceremony. Trump and Chinese President Xi Jinping give a joint statement after their talks. A woman reads a translation during the joint statement. Trump and his wife, Melania, arrived in China and toured the Forbidden City, the historic palace that housed Chinese emperors and their families for almost 500 years. Trump is the first foreign leader to have an official dinner in the palace since the founding of the People’s Republic in 1949. Before traveling to China, Trump spent half the day in South Korea and addressed lawmakers at the National Assembly in Seoul. In the morning, the President attempted to make an unannounced visit to the demilitarized zone between North Korea and South Korea. But he was forced to turn back because of bad weather. South Korean President Moon Jae-in was scheduled to join Trump at the DMZ in a show of unity, White House press secretary Sarah Sanders told reporters. The joint visit would have been the first for a US and South Korean President at the DMZ, Sanders said. The Trumps hold hands at the Forbidden City in Beijing. Reuters photographer Jonathan Ernst goes through security outside the gates of the Forbidden City. A Chinese security official stands in front of the press after Air Force One landed in Beijing. Secret Service members sit in the back of a helicopter as they attempt to fly to the DMZ with the President. They had to turn around because of bad weather. White House press secretary Sarah Sanders speaks to reporters after the DMZ trip was canceled. She said it would have been a “historic moment,” as it would have been the first joint visit there for a US and South Korean President. First lady Melania Trump burns incense during a wreath-laying ceremony at the National Cemetery in Seoul, South Korea. Trump landed in South Korea, the second stop on his trip, and had lunch at Camp Humphreys with troops from both the United States and South Korea. Later, at a joint news conference with South Korean President Moon Jae-in, Trump said he believes the US-led coalition is “making a lot of progress” on the North Korean issue. Moon said he and Trump carried out “candid” talks about the North Korean issue and agreed to scale up regional deployments of military forces. Moon said the United States and South Korea must "maintain (a) strong stance toward North Korea’s threats." Trump has been fiercely critical of KORUS, the free-trade agreement between the United States and South Korea, and he suggested earlier this year that he might terminate it. Trump said Tuesday the two had discussed making changes to the agreement, but he tempered his rhetoric on the issue during the joint appearance. White House press secretary Sarah Sanders checks her phone as staff members fly on a helicopter before heading to South Korea. President Trump kisses first lady Melania Trump after arriving in South Korea. Members of the White House press corps take a moment to file their work between events at the Blue House. A man watches the Trumps’ arrival ceremony at the entrance of the Blue House. A day after arriving in Japan, the first leg of his Asian trip, Trump visited Tokyo’s Imperial Palace for a greeting with Emperor Akihito. He then settled down for meetings and lunch with Prime Minister Shinzo Abe, who has become Trump’s closest partner in Asia as the President confronts an increasingly hostile North Korea. Abe said Japan and the United States are in “complete agreement” as to the way forward in dealing with North Korea, including that now is not the time for direct talks with Pyongyang. He said now is a time for a strengthening of sanctions. Trump, accompanied by Japanese Prime Minister Shinzo Abe, feeds fish at the Akasaka Palace in Tokyo. Reuters journalist Steve Holland wears the many badges and ribbons that the press needed to attend events with Trump on Monday. A pamphlet titled “Abenomics” rests on the table of the meeting room where Trump and Abe were prepared to meet with their staff at the Akasaka Palace. Trump, Abe and their wives pose for a picture with Japanese citizens whose relatives have been kidnapped by the North Korean regime. The Asian tour started in Japan with Trump meeting with American service members stationed at the Yokota Air Base outside Tokyo. In his first set of remarks, Trump avoided the incendiary, bellicose rhetoric that has often defined his public stance about the North Korean threat. But he sent a clear message to North Korea and the rest of the region that American military might and strong US alliances in the region remain a critical deterrent. He then visited Prime Minister Abe, and the two played golf and enjoyed a steak dinner before sitting down for formal talks. White House Chief of Staff John Kelly, left, watches the President greet troops at the Yokota Air Base. A garment bag carries Trump’s golf clothes aboard a helicopter in Tokyo. A helicopter flies over the golf course where Trump and Abe played together. After being awake for 23 hours straight, a member of the White House press corps falls asleep at a restaurant in Tokyo as Trump and Abe have dinner next door. Before heading to Asia, Trump made a stop in Hawaii. He was briefed by leaders of the US Pacific Command and toured the USS Arizona Memorial at Pearl Harbor. He was accompanied by the first lady. The Trumps throw flowers during their visit to the USS Arizona Memorial at Pearl Harbor. White House Chief of Staff John Kelly, right, stands alone at the memorial after the President laid a wreath there. A set of mobile stairs sits on the tarmac of Andrews Air Force Base as the White House press corps walks to Air Force One in Maryland. Jim Watson is a staff photographer for Agence France-Presse based in Washington. Follow him on Instagram and Twitter.